These proprietary formulas from Montiff, Inc. are carefully calibrated to contain just the right proportion of amino acids. Most of them also include synergistic vitamins, minerals and herbal concentrates. These are formulas from which you can FEEL the difference! At least 10 of Montiff's products are listed in the Physicians' Desk Reference. Montiff supplements are among a few of THE most noticeably effective I have ever used. Note: Be sure that the Montiff formulas or any other nutritional supplements you buy are <b>fresh and potent! How to Make Sure the Supplements You Buy are Fresh, Potent and Effective! NOTE: Click on any product graphic for full product details. 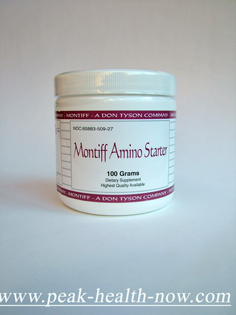 Montiff All-Basic 677 mg / 500 Capsules: The most versatile full-spectrum Amino Acids formula! 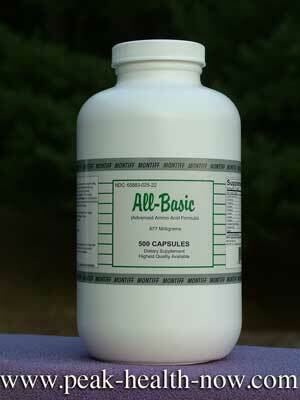 Montiff All-Basic may be taken before, during or after a meal - 2 capsules enhances your nutrition and detox as well! You also may use in larger doses on empty stomach at least 3 hrs after or 30 min before a meal. Always be sure to balance your Amino Acid supplementation with B-Complete, Tri-phos B and/or Vita-Minz Plus! 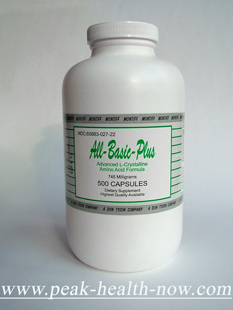 All-Basic Plus capsules: Montiff's full-spectrum Amino Acid formula with L-Tryptophan. This formula should be part of most any supplement protocol. NOTE: This is the same formula as All-Basic - however, All-Basic Plus DOES contain Tryptophan. 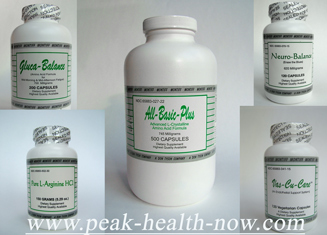 Suggested dosage: 3 caps 2x/day with Montiff Tri-Phos B (listed below in alphabetical order). Take on empty stomach with a glass of water/fruit juice mixture. Start with 2 caps per day on empty stomach at least 3 hrs after or 30 min before a meal. 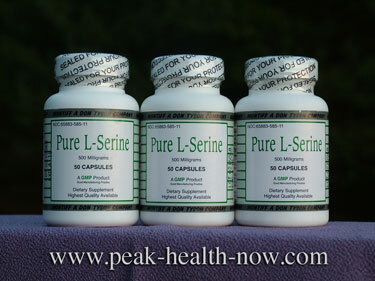 You also may use in larger doses up to 12 capsules per day - cycle up gradually, adding 2 capsules every 3 - 4 days. 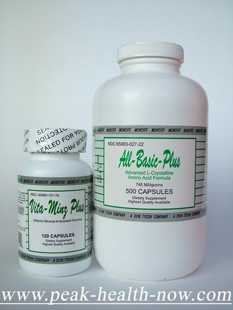 All-Basic Plus / Vita-Minz Plus combo package: A balanced protocol for optimal health. Both Amino Acids and a Multi-Vitamin Mineral are needed for a balanced protocol. SAVE on Shipping/handling for larger quantity! 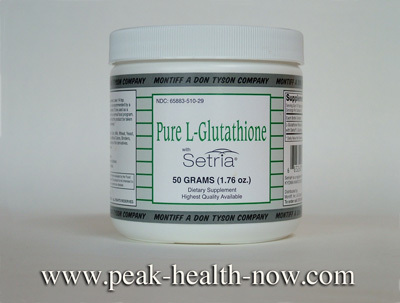 Montiff Amino Starter: This patented formula of L-Alanyl L-Glutamine, L-Alanine, L-Glutamine and Glycine is highly effective for:gut repair (heals the mucosa, endothelial cells lining gut), improving liver function (synthesis of Glutathione), maintaining muscle mass, regeneration of the liver. 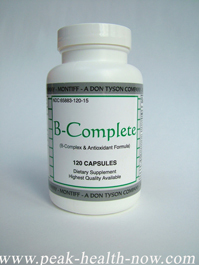 Montiff B-Complete / 120 capsules: This full-spectrum B-complex is an essential companion product for Amino Acids formulas, vital for proper absorption of Amino Acids and to balance them in your supplement protocol. It is taken with meals, 1 capsule 2 - 3 x per day. 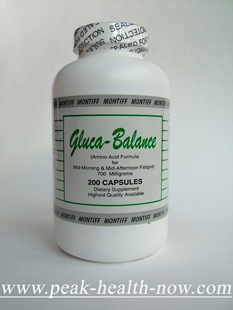 Gluca-Balance 700 mg / 200 caps: This superbly formulated product is excellent help for normalizing blood sugar. 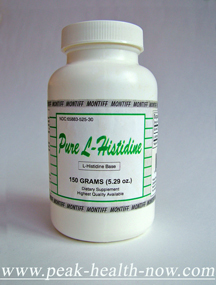 Montiff Pure L-Histidine 150 grams powder **SORRY, THIS PRODUCT HAS BEEN DISCONTINUED** For similar effects, please see our Montiff Vas-cu-Care, a customer favorite! Montiff Joint-Eez 120 caps: Select 1 OR 3 bottles below. 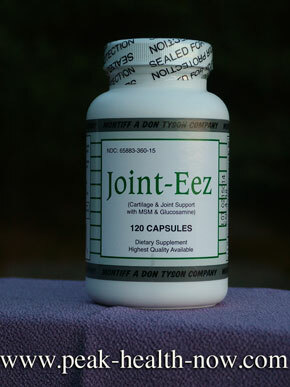 Montiff Joint-Eez 120 caps: 3-pack - Save up to $8.00 on Shipping costs. 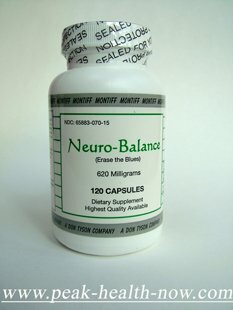 Neuro-Balance 620 mg / 120 capsules: This blend of L-Tyrosine, N-Acetyl L-Tyrosine and the active coenzymatic form of B-6 (Pyridoxal-5-Phosphate) acts as a Catacholamine precursor in a way that many people can feel. Helps to facilitate Dopamine providing more energy, mental clarity and improved mood. 1 - 3 capsules daily, morning and early afternoon on empty stomach. Montiff L-Serine 50 caps: Select 1 OR 3 bottles below. 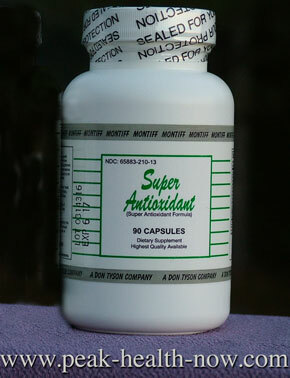 Super Antioxidant 90 caps: Select 1 OR 3 bottles below. Montiff Super Antioxidant 90 caps: 3 pack - SAVE up to $10.00 on shipping costs. 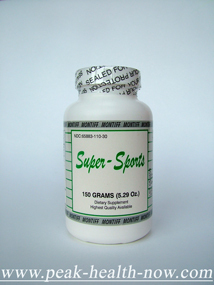 Super-Sports 697 mg - 200 capsules: Select 1 - 3 bottles on drop-down menu. MONTIFF TRI-PHOS-B contains the active co-enzymatic forms of B-1, B-2, and B-6 for maximum utilization of these vitamins. This enteric preparation will dissolve in the intestinal tract, where it can be best absorbed. 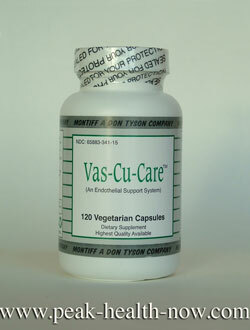 Vas-cu-Care 120 caps: The PREMIER formula for nitric oxide benefits to the endothelium (blood vessel lining). 2000 mg of a proprietary blend of L-Arginine HCL, L-Citrulline, L-Carnitine fumarate, Taurine and Quercetin, plus vitamins, minerals and antioxidants assure comprehensive cardiovascular support. To purchase one or more bottles, select from drop-down menu. 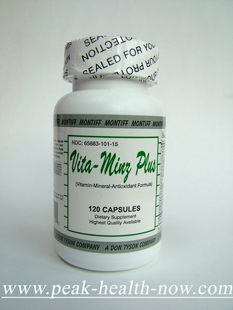 Vita-Minz Plus 120 caps: Montiff's superb blend of vitamins, minerals and herbs - this Multi is second to none! Trypto-Plus 500 mg / 100 caps: Montiff Pure L-Tryptophan provides the body with necessary co-factors to convert Tryptophan to serotonin. 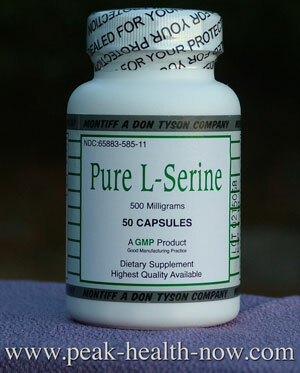 Each capsule contains 500 mg USP L-Tryptophan, Pyridoxal-5-Phosphate (co-enzymatic B-6) and Riboflavin-5-Phosphate (co-enzymatic B-2).